If you are looking for a backpack where you can carry everything you need for your competitions or training sessions, this is the accessory for you. This is an adjustable backpack, which thanks to its adjustable capacity system allows you to increase its capacity so that it can be used in all purposes. Speedos iconic 35L "swimmers go-to" backpack. Classic shape and styling of the Speedo Team Pro backpack with new and improved materials, and a quality addition, like an offset raised laptop sleeve to protect corners. Removable dirt bag keeps wet and dirty items away from electronics and clean clothes. Speedo's Teamster Backpack is a must-have for every swimmer, and now it's available with even more features! The Brick Bag is our most versatile bag. Designed to fit only the essentials for a swim workout or a cycle and run commute it features a snug, tapered design that rides higher on your back to minimize bouncing while on the go. Make it easy for your young swimmer to tote his or her swim stuff with our Fast Sack. This eye-catching bag measures 50 x 35 cm and has a user-friendly 3 compartment design for smart space management. With the same great space management features as its larger counterpart the Fastpack 2.1, the Core is built to handle your everyday gear hauling needs. Whether for the pool or for school, the Fastpack Core will fill your needs. The Spiky 2 backpack is designed for easy, hands-free transport of your swimwear and equipment. With features like adjustable padded straps and back panel, this backpack wears comfortably whether you're walking or biking. From shoes to sports drink, all your items have a spot of their own. A new twist on an old classic, the LATBP30 is packed with state-of-the-art features engineered for athletes on the go. With a cutting-edge space saving design, the 30L maximizes storage without the bulk. Strong black mesh bag. Great for fins, balls, aqua gear or games. Zipper closure with handles. I.D. tag to write your name. Size: 24" x 30". The Arena Spiky 2 backpack is designed for easy, hands-free transport of your essential swimwear and gear. With features like adjustable padded straps and back panel, this backpack wears comfortably whether you're walking or biking. The Stow-It mesh bag is a simple, yet cleverly designed mesh bag. It’s large enough to carry your equipment for a day of adventure yet small enough to stow anywhere. The attached mask bag is uniquely positioned to protect your mask & goggles by keeping them “On-Top” at all times. stowit can be rolled up inside its mask bag for easy and convenient stowage. Made of rugged nylon mesh, stowit allows equipment to be rinsed or dunked without removing. When headed out for your next adventure, grab the JAWS "QuickPACK" to keep your things organized and close. This drawstring backpack is the perfect solution when a full sized backpack is too big and a plastic bag is... well a plastic bag. This full featured drawstring backpack will carry a ton of stuff (figure of speech), not to mention the external mesh pouch for hauling even more! The Waterproof Backpack can carry everything you need while on your bike ride, or enroute to the start line or just heading to the pool, secure in the knowledge that this bag take heavy downpours in their stride. The ultimate in transition bags has been built with triathletes in mind. With a pocket for everything imaginable, all within easy reach the Orca transition bag is hard-wearing and comfortable to carry. The Mesh Gear Bag is a convenient way to store all swim equipment. The Mesh Gear Bag is made of a durable nylon mesh material that lets air flow freely for fast drying, and includes a pull drawstring that securely closes the bag. A small zip compartment safely stores smaller items such as goggles or a Tempo Trainer Pro. The Mesh Bag includes a hook attachment for easy transportation and storage. A waterproof name tag helps identify the Mesh Bag and prevent theft. Machine Washable. A new twist on an old classic, the LATBP45 is packed with state-of-the-art features engineered for athletes on the go. With a cutting-edge space saving design, the 45L maximizes storage without the bulk. The De Soto Transition Pack V8 offers many features and compartments that are beneficial to the most organized person, but also comes in handy when you just want to pack it all up quickly and get home. The OGIO Endurance 8.0 Duffel bag includes an oversized main compartment, a crush resistant pocket to hold valuables, an external bungee cord for helmet storage, and ventilated pockets to hold shoes and dirty clothing. Other features of this pack include a wet/dry pocket, small pockets to hold snacks, and a full sized water bottle pocket. Made using water resistant fabric, this smart laptop bag is ideal for carrying electronic devices to and from the pool. Laptop Size: 40cm x 8cm x 30cm. 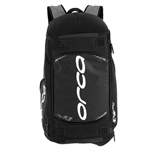 The Arena Fastpack 2.1 is a large backpack specifically designed for Swimmers and triathletes. This rucksack is ideal for taking all your swimming kit and training aids to the pool. Lightweight and waterproof backpack, with a simple tube-construction. Size: 18 X 33 X 68 (30 liter capacity). Our Fast Mesh bag is our go-to choice for a versatile sports bag. This multi-purpose solution is made of sturdy nylon mesh for use in and out of the water. Heavy duty duffle-backpack. U-shape opening for easy access, with one large main compartment, a deep pocket for shoes and lateral pockets to store small items. Made of a durable nylon and polyester mesh, the Ultra Mesh Backpack lets air flow freely for fast drying, and includes a pull drawstring for a secure closure. The Ultra Mesh Backpack is a convenient way to store all swim equipment. Updated with a 20% bigger design, the Big Mesh Mummy Backpack is the perfect choice for hauling swim and workout gear. Gear not included. Store all of your pool gear in one place with Zoot's Mesh Sling Bag. This bag easily swallows a kickboard, buoy and more, with an external zipper pocket for your cap and goggles. Your perfect workout bag is here. The Performance Transition Bag 2.0 is the ideal bag for triathletes and runners in need of a functional bag. The main compartment unfolds with dual zippers for easy access and the ability to organize your gear. With an eternal mesh helmet storage pocket, take this bag along to your workout or your next race. The Speedo Ventilator Mesh Packpack is a Medium sized equipment bag designed to hold all your swimming essentials. Open weave mesh for strength and quick drying. Drawstring closure keeps items together and secure in bag. The new 9.0 Athletic Gym Bag is the answer to any serious athlete's needs. Two water bottle compartments, hide-away stretch mesh helmet storage, and a crush-resistant lockable armored pocket work together to keep your gear in ready condition. An even bigger main compartment promises to fit the bulkiest of gear, while ventilated areas for your sweaty stuff means you don't take the workout smell back to the workplace. Equipped with the backpack-style shoulder straps and padded lip for comfortable carry. Speedos Tri Clops Triathlon Backpack is made with strong, durable lightweight 100 denier double rip-stop nylon and features dedicated pockets for running and cycling footwear make it easy to get what you need, when you need it. Unique AquaJogger Mesh Bag that will easily carry your AquaJogger gear, swimsuit, towel and other pool gear. Our Speedo Ventilator series of bags are perfect for use around the water, but so practical, lightweight and useful, they are ideal for any purpose. Quick drying and strong enough for all your training and miscellaneous gear, these are the perfect bags to load and go. 24" x 17". Speedos iconic 35L "swimmers go-to" backpack. Classic shape and styling of the Speedo Team Pro backpack with new and improved materials, and a quality addition, like an offset raised laptop sleeve to protect corners. Removable dirt bag keeps wet and dirty items away from electronics and clean clothes. Limited time, select colours: get a Latex Swim Cap for $1 (Regular $3.95-$4.95). The Zoot Performance Sport Pack 2.0 is the perfect bag for your morning swim or afternoon run. Carry your fins, paddles and goggles in this lightweight bag, or your running shoes, shorts, and top. The Performance Sport Pack was engineered to withstand the tough demands of all athletes. Zoots newest Ultra Tri Bag is a must! Surprisingly light weight, this durable triathlon-specific bag meets the demands of the toughest triathletes. Showcasing a cavernous 18.5" x 13.25" x 9.75" design, the Alliance Team Backpack II features an internal goggle saver pocket, digital media pocket and reinforced inner pockets for added strength and durability. Suit hanger carabineers provide added versatility, while a large wet/dry compartment allows for quicker drying and reduced odor. Ideal on the pool deck or around campus, the Alliance Team Backpack II is portable storage on the go. Best gift for those who have it all! Select your desired amount on the product page and have it sent out via email or a professional-looking one via snail mail. Note: The full amount paid, including taxes, will be issued as a gift certficate.